When a game is on that you really, really care about, it is not enough to set aside the time to watch it. In Toronto, you have to decide where you will watch it. And sports bars will fight to the teeth to get you to choose them. Some may win you over with high definition television screens that are significantly bigger than your living arrangements. Others will have wings that will be so spicy that you may lose your voice from the heat, rather than from cheering. Some bring sports off of the screen with attached bowling alleys, like the entertainment centre The Ballroom. Or you may be swayed with the brand of a sports megastar. Wayne Gretzky's pays homage to the Great One in every way possible, even charring the burger buns with his jersey number 99. Whether you are a fan of cricket or football, there is a bar in Toronto that is filled with your people. You don't have to feel the rush of sweet victory alone. Nor do you have to cry in your beer solo. Meet some of the thousands of people who care about your passion with just as much intensity as you do. It is one of the joys of being in any large city; you are never alone. Especially when it comes to watching "the game." This watering hole has been open since 18 years before confederation (1849 to be exact). If they don't do beer well, no one does. 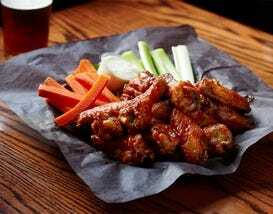 Local Expert Tip: "Sundays, Mondays and Tuesdays after 5pm you can get wings for half price with the purchase of a beverage. Be sure that you like hot when you ask for suicide sauce; they don't mess around."